Are you looking for the best Tehran hotels? If so, you are in the right place! Read on to discover where to stay in the Iranian capital, including the best neighbourhoods for your needs! Since 2014, the number of tourists visiting Iran has increased steadily. On one hand, this is great news for such a misunderstood country, on the other it has made it difficult to book accommodation. During the high season and during Iranian holidays such as Nowruz, the Persian New Year taking place on March 21st, the best hotels in Tehran and beyond are booked months in advance. 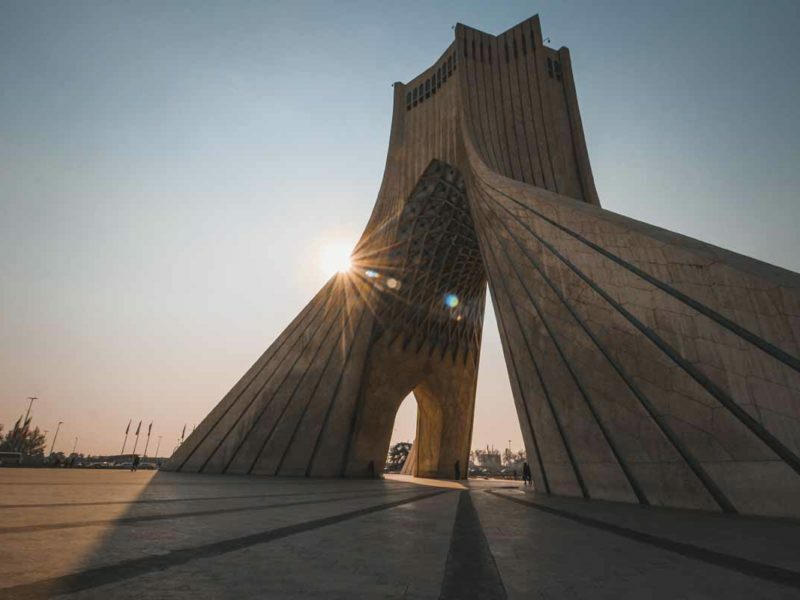 In Tehran, there is a wide variety of places to stay – you can opt for historic hotels, business hotels, guesthouses, homestays, hostels, and luxury hotels, depending on what you are looking for. However, room availability in Tehran and other cities is not increasing as fast as the tourist influx. As a result, you may find it hard to find a place to stay when visiting during busy periods. Don’t forget to book your Tehran hotel as soon as you have decided on your itinerary! On top of that, finding the right neighbourhood to stay in Tehran is likely to be a formidable task. The city is absolutely huge, and different neighbourhoods offer very different experiences. Are you wondering how to find the best Tehran hotels? No worries, we’ve got you covered! Another big problem for foreigners traveling to Iran is booking hotels. Because of international sanctions, it is not possible to use international platforms like Booking.com. You may think that it’s impossible to book a hotel in Tehran or elsewhere with just two clicks – but in fact, you can! 1st Quest is the first online portal offering not just the opportunity to book hotels all over Iran, but also visas, insurance, and transfers. Have a look at our how to book hotels in Iran post to know more about 1st Quest! In this article, we’ve collected all the best hotels in Tehran divided by neighbourhood, so that you can book the perfect one for you. Whether you are looking for accommodation near Tehran’s main tourist attractions, close to the shops, or you are looking for a hotel near best nightlife in town, I hope you will find your Tehran hotel here! Tehran is a massive city, and its traffic will drive you insane. It is know for being an ‘ugly’ place, and for this reason, many travellers try to get out as quickly as possible. 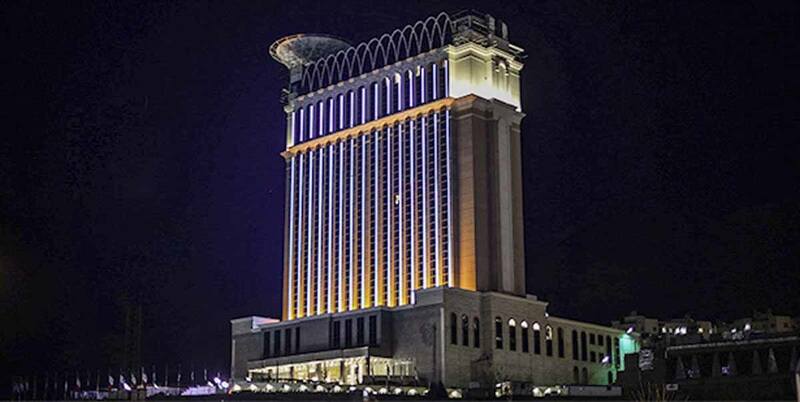 This is the Espinas, a luxury hotel in Tehran! In my opinion, Tehran is actually really cool, and it’s worth spending a few days. To know more, check this post of mine – 5 things to do in Tehran and why you shouldn’t miss it. In any case, even if you do decide to spend as little time in Tehran as possible, you are pretty much forced to spend at least one or two nights, as most flights to and from Iran land in the middle of the night. While you’re there, you may as well make the most of it! Besides being the capital, Tehran is also the largest city in Iran, home to 14 million people. The city is divided into 22 municipal districts, which are divided further into distinct neighbourhoods. The most convenient district, and the closest one many points of interest, is the 12th district in heart of the city. If this is your first time visiting Tehran, or if you have children and you don’t want to travel too far on the subway, District 12 is definitely the best option for you. In this guide, we’ll take a look at the best Tehran hotels and neighbourhoods, including district 12, but also others. District 12 is Tehran’s ‘historic centre’. It is the heart of the capital, and the place from which the city grew. Here is where you’ll find the highest concentration of historical sights, including churches, mosques, as well as large squares and museums. Hop on the subway to Imam Khomeini Square, right in the centre of District 12, and from there you can start exploring the city. The covered Grand Bazaar is located right here, stretching over several city blocks, with vendors selling anything you can possibly imagine. It is one of the liveliest (and most crowded!) areas of the city, with lots of restaurants and cafes, as well as historical sights and cultural institutions. Every tourist visiting Tehran for the first time should put district 12 at the top of their ‘where to stay in Tehran’ list – let’s have a look at the best hotels now! 4-star Ferdowsi International Grand Hotel is certainly worth mentioning as one of the best hotels in Tehran. It offers spacious and comfortable rooms, a conference room, restaurant, gym and 24-hour wifi. 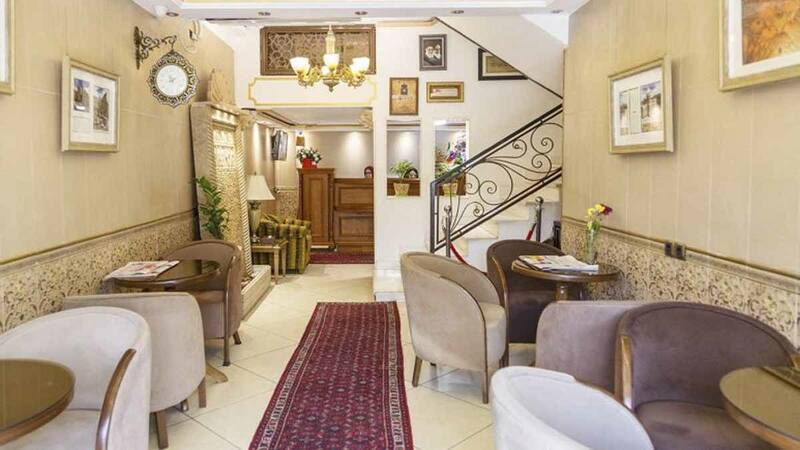 Located just north of the Imam Khomeini square, right in the centre, the hotel is within walking distance from the Grand Bazaar, Golestan Palace and the jewellery museum. You can’t get any more convenient than that! Another good choice is Golestan Hotel. To be precise, it is not exactly in district 12, but in district 11, just a short walk away. This is a small family-run hotel, with comfortable rooms and excellent value for money. It also offers a number of other services, such as laundry, taxi service and restaurant. This is the best option for budget-conscious people who do not want to give up a bit of comfort! 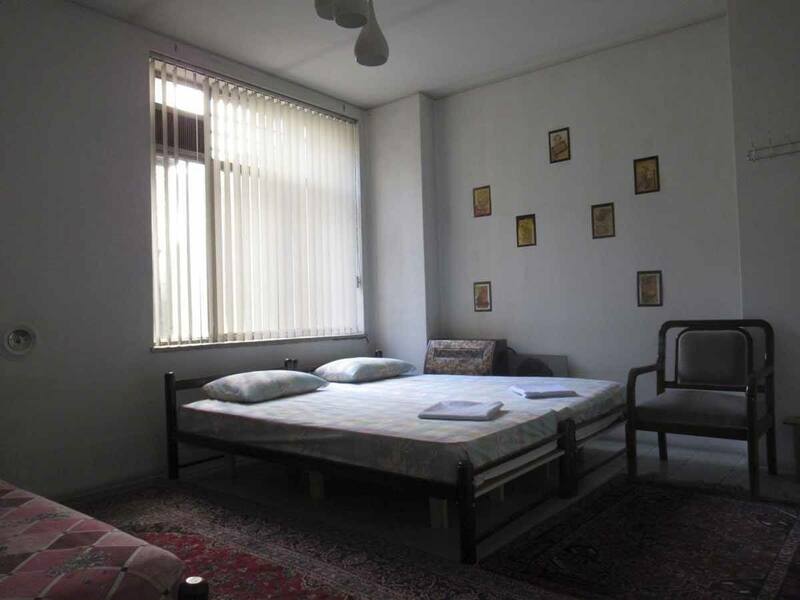 Another budget accommodation to consider is the Heritage Tehran Hostel. It is one of the largest hostels in the city, with both dorms and private rooms. Each bunk bed has its own curtains for privacy, locker, electric socket and a reading lamp. There is also a mini-bar, kitchen, laundry and common room. Our final budget choice is the pretty Iran Markazi Hotel. The rooms are nice and clean, the staff very friendly and the breakfast is free. District 6 of Tehran is one of the oldest neighbourhoods in the city and it is very close to the city centre, just north of District 12. This district also houses the campus of the University of Tehran, with its many colleges and student dormitories, making it one of the most important student centres in Iran. It is also home to the Amir Kabir University, which is one of the most important technical universities in Iran. Its large university population is the reason behind the ‘chilled out’ feel and the abundance of cafes and restaurants, perfect to enjoy during the day or night. District 6 is where you should opt to stay if you want to experience Tehran’s nightlife. However, keep in mind that nightlife is a bit different in Tehran compared to the West, since alcohol is banned! Instead of going to bars, the people of Tehran spend their evening hours in cafes, restaurants, art galleries and parks. In District 6 you’ll also find the charming neighbourhood of Iranshahr, where you will find a wide variety of hotels, hostels, apartments and bed and breakfasts that cater to travellers of all ages, styles and budgets. In district 6 you’ll find one of the best hotels in Tehran, the Espinas Hotel Khalij Fars, a luxurious 5-star hotel with spacious rooms and suites equipped with every kind of comfort. What a view for sunset tea! This luxurious property in central Tehran also features a modern fitness centre, a swimming pool, a coffee shop and two restaurants, one with Mediterranean cuisine and one with traditional Persian cuisine. 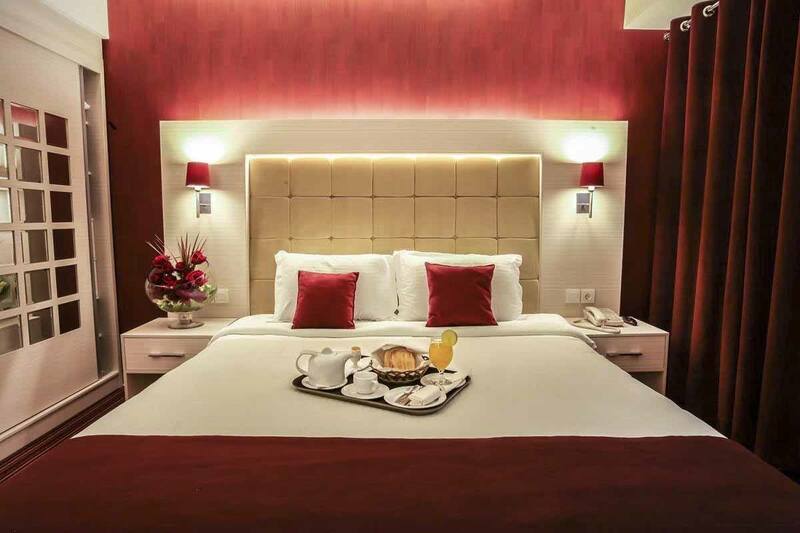 A different 5 star hotel I really like is the Laleh International Hotel – rooms and suites are stylishly decorated, spacious and equipped with Wifi, and bathrooms are bright and airy. Another upmarket choice is the delightful Howeyzeh Hotel. It is located in one of the best parts downtown Tehran, a stone’s throw from the Golestan Palace. 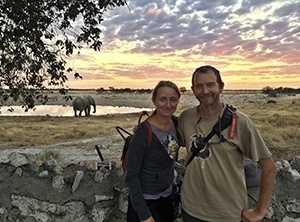 The Howeyzeh hotel has 150 rooms, suites, VIPs and doubles. The hotel restaurant offers both Iranian and non-Iranian meals, and it is open 24/7. Other services offered by the hotel are 4 function rooms, saunas and jacuzzi, disabled access, laundry service , SPA, free Wi-Fi in the hall and in the rooms, and free parking. My final choice in District 6 is Sepand Hotel, offering super clean rooms with bathrooms and pickups to and from the airport. The strong point of this hotel is the kindness of the staff, ready to give you a hand on whatever you might need. District 7 is also located in the heart of Tehran. It houses the highest concentration of restaurants and cafes in Tehran – famous names are the House of Artists, Kafka Cafe, Cafe Remnes, Black and White Café, Baba Bozorg (Grandpa) Tea House, Bagh-e Saba Tea House, and many more. Sohrevardi is a charming neighbourhood in District 7, located north-east of the city centre. It is well connected to Tehran via the metro and it is probably the best place in Tehran for foodies! This neighbourhood is full of restaurants and cafes, serving delicious Middle Eastern and Persian cuisine, plus lots of street snacks. One thing is certain, you won’t go hungry in District 7! Iran Cozy Hostel is one of the best hostels in the city. With comfortable common spaces and a true ‘family feel’, this is the right place to feel at home, even in Tehran. 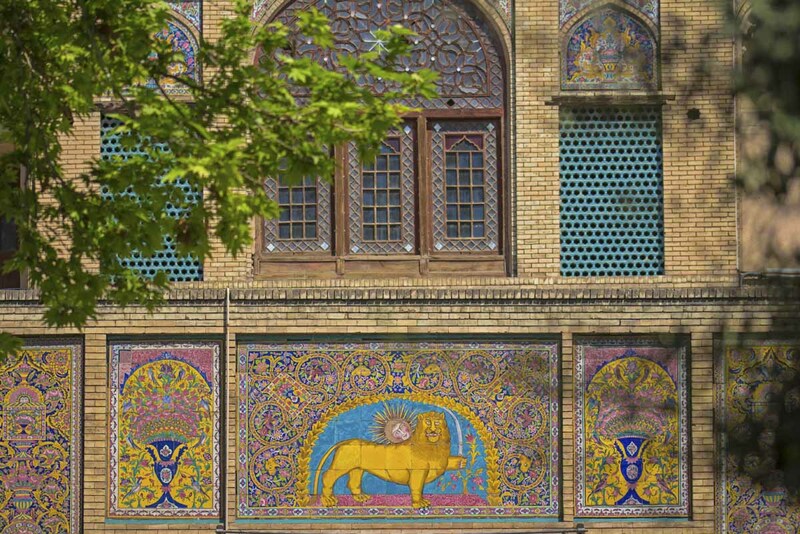 It’s also well located to visit Tehran attractions like the Grand Bazaar and Golestan Palace. The metro station is a 5-minute walk away and the area has a large selection of restaurants. Another excellent hostel is the Hi Tehran Hostel. The building is modern in appearance and the rooms are clean and welcoming. There are also common areas and a courtyard where guests can relax and chat. District 2 is adjacent to the famous Azadi (Freedom) Square, and to the green gardens of Farahzad and Evin. This district was once full of gardens and streams, but in the last two decades more and more apartment buildings have sprung up as the city continues to grow. Despite this, District 2 is a quiet place (in Tehran terms, of course) as much of it is still covered in parks. The northern part of Tehran is the part of the city that has the cleanest air, and the most beautiful mountain views. Even though it is a little further away from the centre, green spaces, tranquility and clean air make it the best option in Tehran for families with children. Here you’ll find most of Tehran’s luxury hotels, plenty of restaurants and shopping malls. The northern part of Tehran is where you’ll find the greatest concentration of luxury hotels. Among these, the Parsian Azadi Hotel (formerly Hyatt Hotel) stands out, having welcomed notable guests for decades. It has spacious rooms equipped with modern amenities such as flat-screen TV with satellite channels, Wi-Fi, air conditioning, refrigerator and minibar. If this were not enough, the Parsian also offers numerous dining options and a wellness centre with indoor pool, massage room, traditional bath and a gym. Another famous hotel is the Espinas Palace Hotel – it has elegantly furnished rooms in traditional style, and modern facilities offering guests a relaxing stay. This hotel also has various choices for dining, SPA and wellness centre, Jacuzzi and gym. 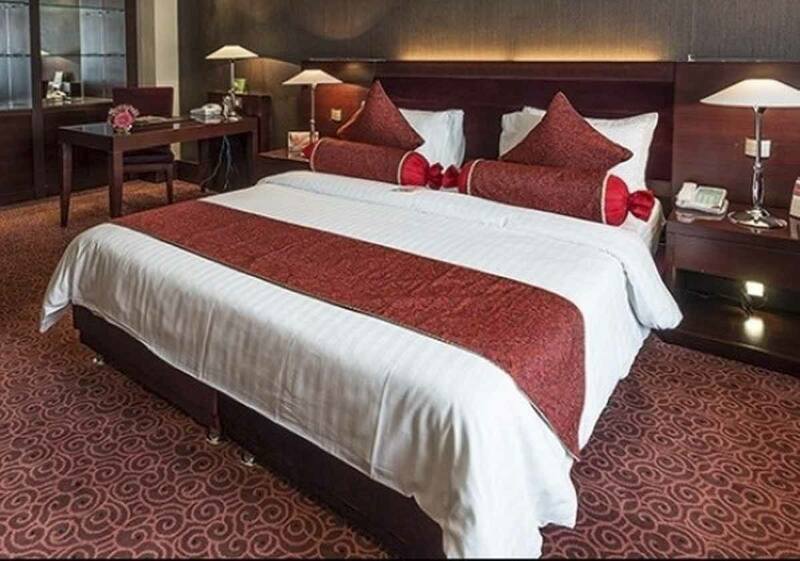 If you want to leave immediately for Shiraz or Isfahan just after your late night arrival in Tehran, the best option is to stop and sleep in a hotel near Imam Khomeini international airport. The good news is that there are two excellent hotels nearby! The first choice is definitely the Novotel. This is a modern upscale with an incredible advantage – you just need to walk across a bridge to get there from the airport! It really takes only 5 minutes from the airport exit to the hotel doors, so you don’t even have to take a taxi. Furthermore, its first-class services and facilities make it one of the best hotels in Tehran. The second hotel, also located opposite the terminal, is the Ibis Tehran Imam Khomeini International Airport. The Ibis is also modern and equipped with all comforts, has a restaurant serving Persian and international dishes, and guests also have access to the fitness centre and swimming pool of the adjacent Novotel hotel. It’s a little more affordable and less luxurious than the Novotel, but it’s another solid choice for a Tehran airport hotel. Can you give us any info about the prices in the Tehran hotels? I’m planning a business trip but I’m not sure what can I expect. Your post gave me an image of the Tehran I didn’t have before (everything I heard so far was info I got from a colleague who visited it last year). Dear Steven, I didn’t add the price for each hotel because they vary quite a lot throughout according to high/low season plus the ever-fluctuating rial exchange rate. 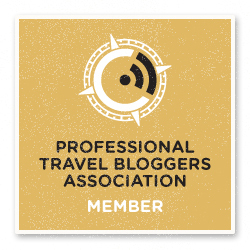 However if you follow links it will take you on a booking platform where you can check each hotel individually according to your dates and number of people travelling. Hope it helps, enjoy Tehran, it’s an awesome city!